Babka is nearly a weekly occurrence in my house, and I can think of few things better. But it’s not just me: Babka has really been getting the recognition it deserves all over the country, making appearances everywhere from artisanal bakeries to Jewish delis and even high-end restaurants. My babka recipe is rich, buttery and loaded with eggs, more closely related to brioche than to the old, which is what I wanted for these babka-donut hybrids. I increased the flour content and the eggs, making for a sturdier dough, and I reduced the amount of butter — just by a smidge so the dough would stand up better to frying. For a little crunch and to offset the sweetness of the filling and dough I added cacao nibs, which impart a slightly bitter flavor and some nice crunch too. Cacao (or cocoa) nibs are dried, fermented pieces of coffee beans – a very pure, intense chocolaty flavor. You can find them at Whole Foods, specialty food stores (like a health food store), or on Amazon. With these donuts you get all the pillowy softness of babka, plus the moisture that deep-frying locks into the dough. The dark chocolate pastry cream would be lovely in a tart, cream puffs or on cake, but here, along with the cacao nib sugar, it serves to further complement the dough and turns the whole treat into something much more than just chocolate babka. Both donuts and babka are time-intensive kitchen projects — usually, it’d be either or — and that choice would be pretty hard to make. But with these donuts both are possible at once. And if that isn’t a Hanukkah miracle, then I don’t know what is. Please note: you want to make the dough the night before you will fry, so plan accordingly. To make the cacao nib sugar: In a food processor, grind the cacao nibs until fine. Combine the pulverized cacao nibs and sugar. Transfer to an airtight container until ready to use. The next step is to make the pastry cream, since it needs to set before you fill the doughnuts. Whisk together yolks, vanilla,sugar, cornstarch, cocoa powder and salt. In a heavy saucepan bring milk just to a boil over moderate heat and in a stream add 1/4 cup to egg mixture, whisking until smooth. Transfer the milk-and-egg mixture to the pan with the rest of the milk and bring to a boil, whisking (the mixture will look curdled but will become smooth as whisked). Boil the mixture, whisking vigorously, 1 minute and remove from heat. Stir in chocolate and butter, stirring until melted and combined well. Transfer to a heatproof bowl and chill, surface covered with plastic wrap, overnight, or until ready to fill doughnuts. To make the doughnut dough: Heat the milk until warm to the touch, around 110°F. Add the eggs to the warm milk mixture and whisk gently to combine. Butter a medium bowl and set aside. In the bowl of a stand mixer fitted with the paddle attachment, combine the flour, sugar, yeast and salt. Add the milk mixture and mix just until combined. Switch to the dough hook and knead the dough on low speed, about 3 minutes. The dough will be sticky — this is perfectly fine. Increase the speed to medium and add the butter, a piece or two at a time. In the mixer, let the dough mix until completely smooth and elastic. To test the dough’s readiness, try stretching a piece of it. It should stretch easily to a point where it becomes translucent but doesn’t rip. Put the dough in a buttered bowl, cover with plastic wrap and refrigerate for minimum of 12 hours, or overnight. The next day, when ready to make the donuts, line two baking sheets with parchment paper. Dust the paper well with flour. Tip the cold dough onto a lightly floured work surface and roll it into a 9 1/2 by 12 1 ⁄2-inch rectangle. It should be about 1/2 inch thick. Using a 3-inch round cookie cutter, cut out 12 dough rounds and set them on the prepared sheets. Lightly cover them with plastic wrap and set in a warm place to proof for about 1 1/2 hours. After proofing, the dough should look puffy and spring back slowly when pressed gently. When you’re ready to fry, line a rimmed baking sheet with paper towels. Prepare the cacao nib sugar in a bowl nearby. Spoon the pastry cream into a pastry bag fitted with a small round tip. Add the oil to a medium, heavy-bottomed pot or to a deep fryer. Heat the oil to between 350°F and 365°F. Carefully add 2 to 3 doughnuts to the oil and fry them until golden brown, 2 to 3 minutes per side. Using a slotted spoon, put the doughnuts on the paper towels. After about 1 minute, when the donuts are cool enough to handle, toss them in the cacao nib sugar. Repeat with the remaining dough. To fill the donuts, put the pastry cream in a pastry bag. 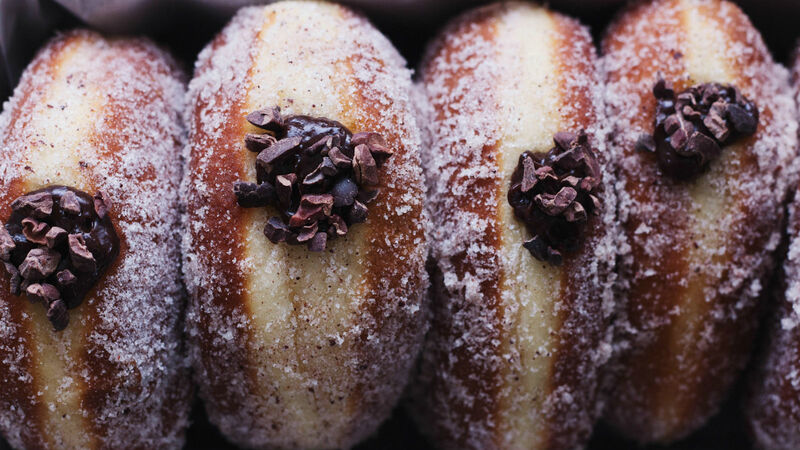 Using a knife or a chopstick, poke a hole into one side of each donut. Be careful not to poke through the other side. Insert the tip of the pastry bag into the hole and gently squeeze to fill. 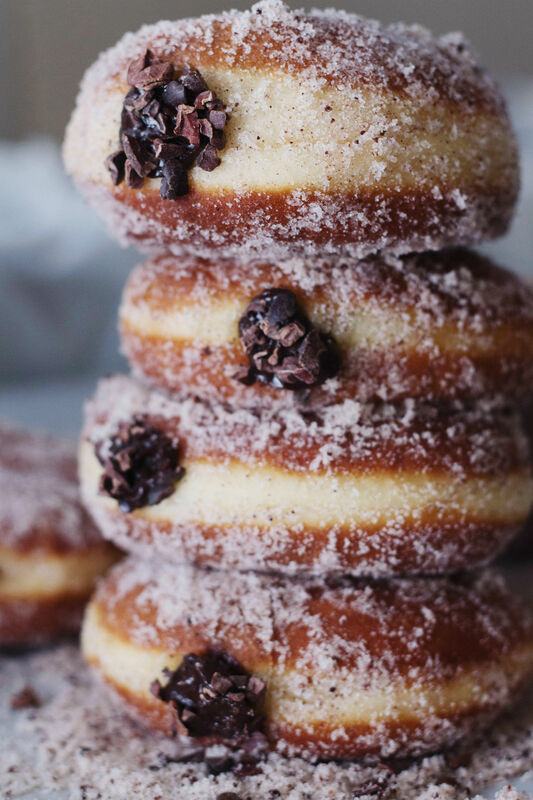 An Israeli-style sufganiya, but with a classic American flavor pairing. Bite into these heavenly biscuits with melty chocolate for an instant mood-lift. Why Do We Eat Jelly Donuts on Hanukkah? The answer has everything to do with agriculture, food politics and -- of course -- tastebuds.